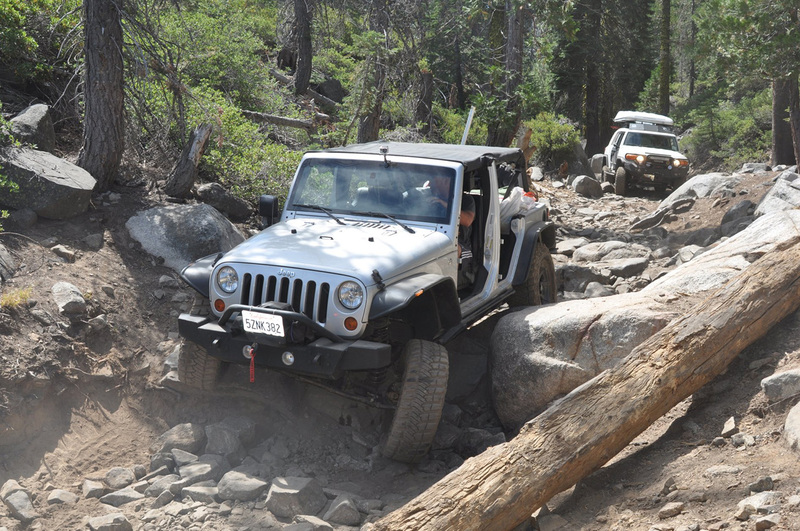 This is an multi-part post written by Jeremy Knight about his 2013 adventure on the Rubicon as a first-timer. The run through the Big sluice was going to be our “short and easy” day. It was Erik’s birthday and he was spending it on the trail. Pretty cool. I cooked a birthday breakfast frittata, overland-style: baby potatoes, sweet onions, bacon, eggs, and cheese in a Snow Peak cast iron pan, on my Partner Steel folding stove. I was so happy that we were finally getting this done. What a privilege, what an experience! So we got off to a lazy start, not really expecting much trail resistance, though I’m not clear why. I think we figured we had seen the worst of it until Cadillac Hill, which we’d hit the following day. 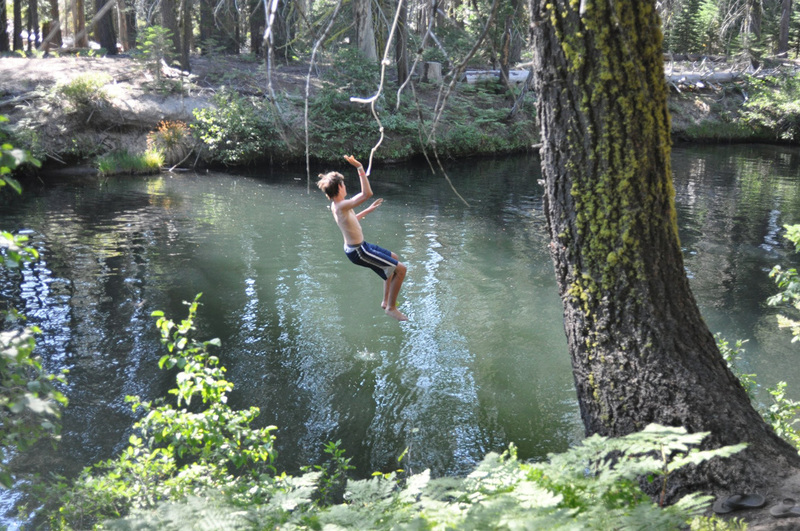 Today we weren’t expecting much, just an easy day to relax at Rubicon Springs, go for a swim, grill some birthday steaks, watch a movie, and enjoy the last night of our adventure. Low pressure, no stress. I felt extremely blessed. We had been challenged beyond what we had expected but hadn’t gotten stuck or broken anything. Sure, my skids and sliders had paid the price, but that’s what they’re there for: peace-of-mind. Erik’s Jeep had performed well beyond his expectations. He had done a great job preparing it. I was very impressed. He was driving well beyond his experience, and didn’t realize that he had the ability. He would understand better by the end of the next day. My brother is a natural. So, we hit the trail back in phase with the rest of the flow. As we descended down the hill, we encountered up-hill traffic and pulled over as quickly as we could to let them by. Once they passed, we saw a couple of nicely dressed Rubicons behind us. We let them go ahead so that we could get a read on the severity of the trail. After we did, the one in the back stopped and asked my brother if “we should let the Toyota (me) get between the two Jeeps so that we can pull him out when he gets stuck.” Jeepers. Wow! I politely declined, and thanked him for his “thoughtfulness.” Ironically, he was the only vehicle who had to be pulled out that day when he high-centered on a tree stump. Below where we had met the buggies the night before, we met up with our first challenge. A rather nasty tree-rock squeeze that I was convinced would give me my first body damage. Erik and I managed to squeeze off to the side of the trail so that we could get some beta on the best line. The string of drivers were more than happy to offer advice from their past experiences. Everyone is like family on the trail. The guy in front of you has to succeed, before you get a chance to try. 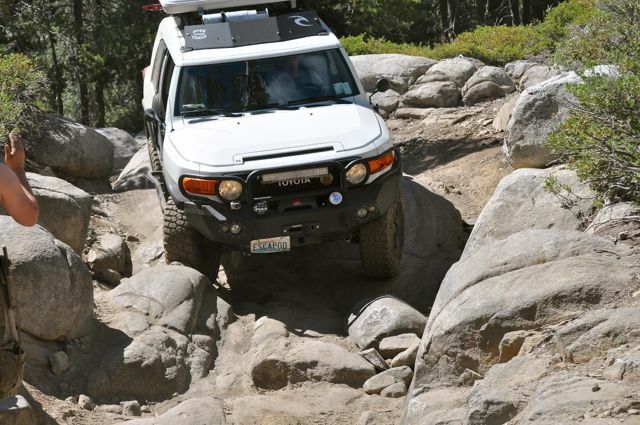 The most successful line was to take it wide, smearing the rocks on the passenger side and delay your turn as long as possible. 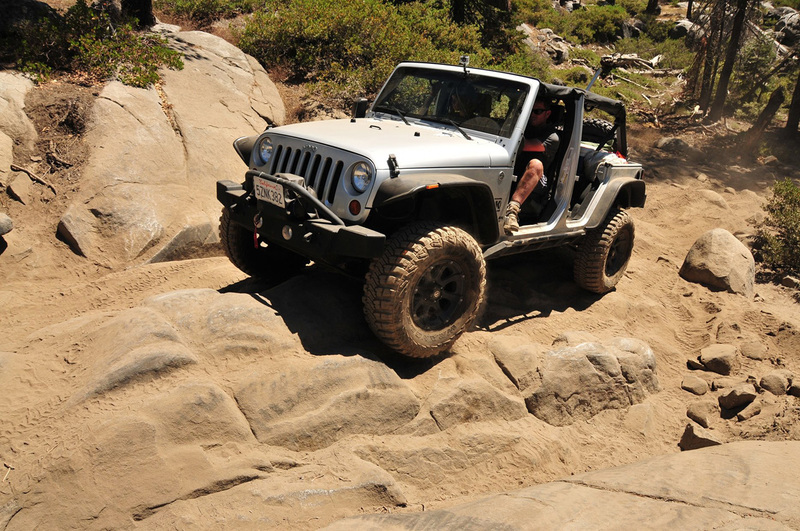 This sets you up to go straight through; so that you don’t take out your rear body panels on either rock or tree. The tree in the contact zone was easy to identify—it was missing a lot of its bark. Our approach was a bit iffy but we both made to through fine, thanks to Josh’s excellent trail calling. All you could do was laugh and hope you could make it. Our journey continued deeper into the Big Sluice. 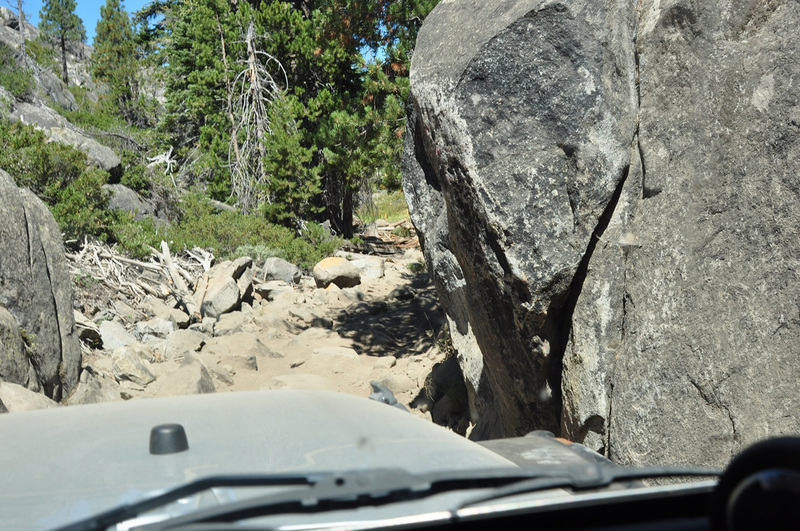 The rocks got bigger and the trail got narrower. As the line of vehicles backed up in front of us, it gave us a chance to jump out of our rigs and watch other drivers tackle the sections ahead. It gave us a better idea of which lines might work and which ones weren’t a good idea. It would have been fun to watch, vicariously, but we were participants. Watching for fun was out of the question, especially considering the limitations of my FJ, which was, quite frankly, getting beat pretty hard. Earlier we would reconnoiter about every hundred yards or so, now it was happening every 50 to 100 feet. We were fortunate that we found ourselves at the end of the line, with no pressure from behind. Pressure, in unfamiliar territory, forces mistakes. I felt that I had no margin for error. My skids and sliders were in almost constant contact with the trail in one way of another—it was very unnerving, especially with all of the spectators. We finally made it through. There was a narrow spot before the bridge crossed the river, and a particularly nasty spot coming up the other side. But we made it into the Springs and found a beautiful camp spot near all of the empty Forest Service crew tents. We made camp and talked with passers by. Then we had a nice swim and lazed around on the warm granite rocks until it was time for dinner. 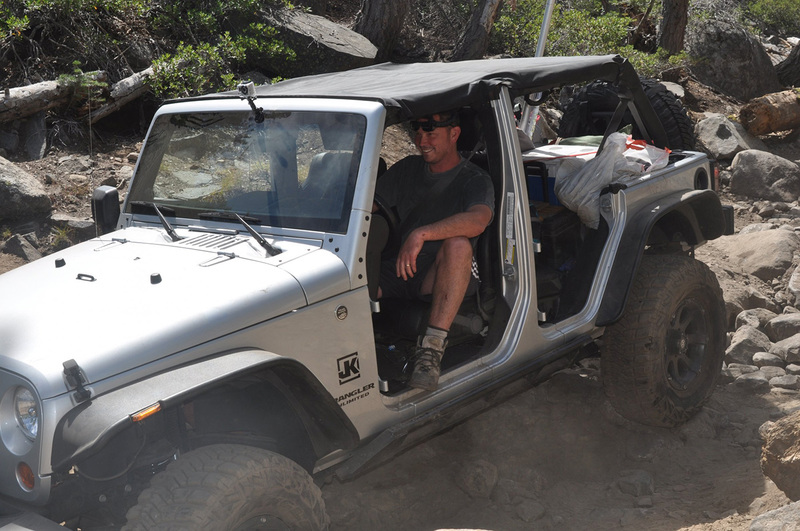 We met up with Dave, a nice guy and the caretaker of Rubicon Springs. He looked at our rigs, especially Erik’s. 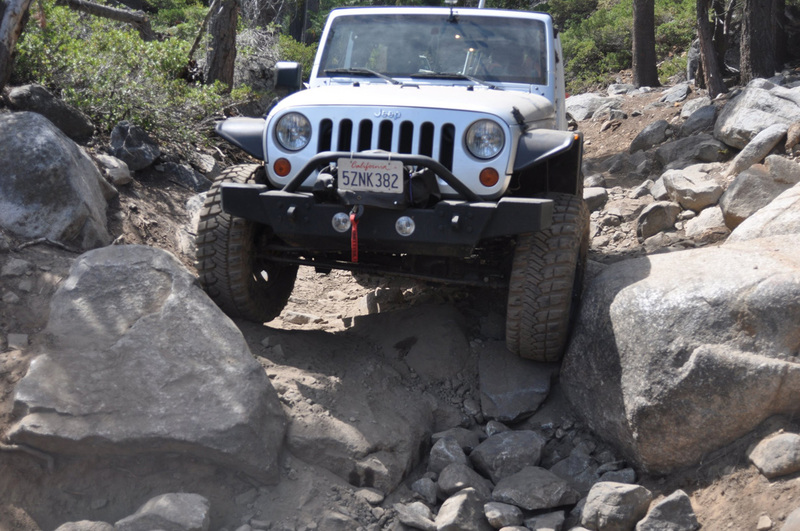 The Rubicon is definitely Jeep territory, they speak their own language. It mainly consists of terms like D44 (axle), JK (model), 42s (tires), 4.11 (gears), YJ (another model), D60 (a bigger axle), and EVO Double Throw Down (whatever that is). Then he came to mine, walked all the way around, and all he said was, “By the time most of these get here, they’re usually missing most of their plastic.” I smiled. For dinner I grilled tri-tip and we uncorked the Mt Baker Moonshine I bought Erik for his birthday. To close out the night we watched “Beyond the Thunderdome” in honor of the buggy drivers.